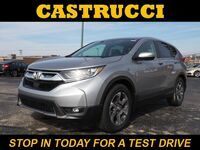 Honda is always looking for ways to improve its vehicles, and that class-leading attitude is perfectly displayed by the 2017 Honda CR-V. 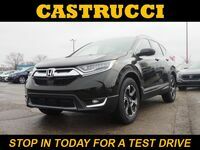 The Honda CR-V has been at the top of its class for many years, but the automaker still redesigned the vehicle from the ground up, now featuring a modernized dashboard, an enhanced information cluster, an updated touchscreen display, and a new turbocharged engine option. So how does the redesigned 2017 Honda CR-V compare to top competitors in its class? 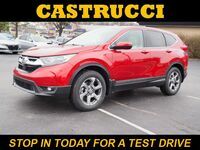 Our team at Matt Castrucci Honda is digging deep to find out, putting the 2017 CR-V head-to-head against one of its toughest competitors: the 2017 Nissan Rogue. Read on to learn about the features and specifications offered by both popular vehicles! The 2017 Nissan Rogue comes in six trim levels: S, SV, Midnight Edition, SL, SV Hybrid, and SL Hybrid. The S, SV, Midnight Edition, and SL trims come equipped with a a 2.5-liter 4-cylinder engine that kicks out 170 horsepower and 175 pound-feet of torque, while the SV Hybrid and SL Hybrid trims have a standard 2.0-liter 4-cylinder hybrid engine with the Electric Motor Utilizing Intelligent Dual Clutch System and a lithium-ion battery. The hybrid engine produces 176 horsepower and 141 pound-feet of torque. It's important to note that both of these engine options have a smaller output than even the 2017 Honda CR-V's base engine option. The 2017 Honda CR-V comes in four trim levels: LX, EX, EX-L, and Touring. The LX trim comes equipped with a 2.4-liter inline 4-cylinder engine with a maximum output of 184 horsepower and 180 pound-feet of torque, while the EX, EX-L, and Touring trims have a standard 1.5-liter single-scroll turbocharged engine that kicks out 190 horsepower and 179 pound-feet of torque. 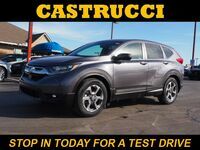 Even the 2017 CR-V's base trim comes equipped with features that are unavailable on the 2017 Rogue, including automatic climate control, floor mats, stereo anti-theft, and alloy wheels. Additionally, the 2017 CR-V offers more cargo space and passenger space than the 2017 Rogue. 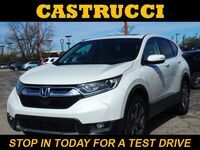 Car shoppers looking for more information about the 2017 Honda CR-V are encouraged to contact a member of our team here at Matt Castrucci Honda. 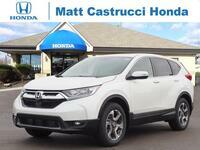 We'll fill you in on everything you need to know about the vehicle and answer any questions you may have. Those ready to get behind the wheel of the crossover SUV are encouraged to give our team a call or schedule an obligation-free test drive online today!